DIY folks are not content with just using old-fashioned notions and ways of doing things. They’re willing to experiment a little bit and try things that are radically new and potentially beneficial. The time-honored tradition of flooring work is to use hardwood but that is not only expensive, it can be harmful to the environment. Hardwood trees are necessary to cut down on carbon pollution and maintain the biosphere, and something that is renewable would a better choice. The environmentally conscious people who enjoy working on their homes will find that some green grass is probably some of the best construction material to be found. Now, this isn’t the type of grass you see on a golf course in the front lawn. It’s bamboo. Believe it or not, bamboo is actually a grass that has been used for centuries in Asia for all kinds of construction activity. It is rapidly becoming the material of choice for environmentally conscious people wishing to do some work on the floors of the home, or even the walls of a particular room. Bamboo’s greatest contribution to green DIY is its renewable nature. This grass grows rapidly and becomes quite usable in just a matter of a few years at the most. It is able to withstand moisture and insects, making it ideal for homes in areas of high humidity. Bamboo can really be quite a tease. 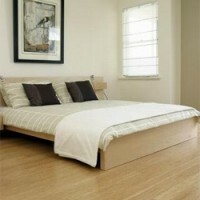 Moso bamboo is being used for flooring and it looks almost like an expensive hardwood but it isn’t. Bamboo is fairly easy to install and that makes it perfect for the DIY fan who wants to touch up the walking surface of the dining room or bathroom. A home office or den (a.k.a. man cave) looks very impressive with paneling on the wall. Bamboo looks fantastic as paneling and is nowhere near as expensive as mahogany. This sturdy grass can also be used to make doors and the frames for pictures and windows. It is the natural, tranquil quality of the material that makes bamboo so appealing. It brings a whisper of the Asian tropical forests right into suburban home. Even if it were not a green construction material, bamboo’s appearance and overall tone would make a logical alternative to oak or pine. It goes without saying that bamboo paneling and framing are priced within the budget of almost all middle-class families. The same is true for furniture or decorative pieces that are made from this highly pliable material. Bamboo can improve the decor of any room and further enhancements can be provided by decorative window film. The right type of stencil or outline on the window film can highlight the color and finish of bamboo window frames or wall coverings, and create an atmosphere that is completely amazing. There is no need to worry about any environmental loss because bamboo replenishes itself so quickly. The proven qualities of bamboo and its overall usefulness are the primary reason why those in the green-know this is a construction material of eco-choice.